National Salt Distributors, LLC is proud to be a 4th Generation Family Business! Inspired by the plight of the dairy farmer in 1949, Howard Buck founded what would be known as National Soft Water Service in West Liberty, Ohio. While working as a field man for Borden Milk Company in Shelby County, Buck first realized the need for soft water after watching dairy farmers use rods and hammers to break through the calcium deposits on the outlets of their milk house heaters. Compounding their problems, the dairymen’s utensils – then washed in hard water – accumulated iron and calcium, forming a film called “milk stone”. Milk stone was a haven for bacteria growth, resulting in high bacteria count and loss of income for the dairymen. 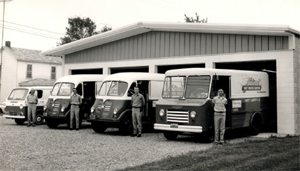 In an effort to help find a remedy for the dairy farmers hard water woes, Buck traveled to Illinois, which at that time was the headquarters for the water conditioning industry in its infancy. Howard started out of a rented garage making installs with his Studebaker car. Dairy farmers were so impressed with the water softening known as “exchange” tanks; many had them installed in their homes. As the use of in-home water increased with the advent of automatic washing machines, water softeners were also developed to automatically create their own brine solutions from dry salt, and regenerate themselves. 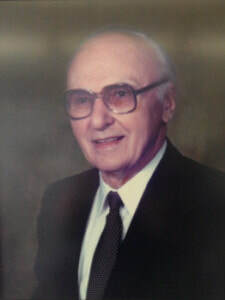 Lowell Buck, the son of Howard, was the 2nd generation family business owner. Lowell was instrumental in evolving the company from the exchange tank procedure to the fully automated water softeners. Established routes would then deliver bagged salt to commercial and residential customers. In the early 1980’s, Lowell took notice that salt customers were enticed by convenience buying at other retail businesses, such as grocery and hardware stores, other than returning to our water conditioning dealership in West Liberty so he began making changes. 1985 – National Soft Water Service opened up a convenient full service branch store in Bellefontaine offering a full line of water softener salt. Another Branch store was soon opened in Marysville, Ohio. By the late 80’s, Lowell continued to notice more and more retail stores carrying water softener salt. 1989 – Lowell approached his son Steve Buck with the idea of beginning a forklift delivery wholesale distribution division. This formed the 3rd generation development of the family business and the beginning of the wholesale salt division. 1993 – National Soft Water Service sold the water conditioning entity of the business to Hague Water Conditioning in Groveport, Ohio. Later they sold the Marysville retail store to Hague as well. At that time, National Salt Distributors, Inc. was formed. 2013 – After graduating college, Steve’s Daughter, Delanie Buck, joined the business which formed the 4th generation development of the family business. In doing so, National Salt became one of the 3% of businesses that continues into the 4th Generation! 2017 – The retail division of the business was sold to Aqua Systems, which remains in the same location as National Salt Distributors at 1515 S. Main St., Bellefontaine, Ohio. Aqua Systems is a full-service water treatment dealership offering sales, service, financing and rentals. Today, National Salt Distributors' Wholesale Division has become Ohio’s leading supplier of Cargill Salt products. We specialize in forklift delivery with our semi-tractor flatbeds and straight truck. With our forklift delivery, we make for a simple and easy solution to salt delivery. We distribute a wide variety of salts such as, softener salt, deicing salt, food grade and agricultural salt. We provide all types of specialized deliveries from the basic flatbed delivery to van, bulk pneumatic, and bulk dump. We offer quantity discounts for salt orders starting at 6-pallets up to full truckload orders of 18-pallets or 25 ton. Our distribution area covers the greater part of Ohio where we service a wide array of customers such as water conditioning dealers, grocery stores, hardware, mini-marts, prisons, gas stations, farms, landscapers, municipalities, colleges/universities, drive thru’s, and car washes. The success of our business is dependent on the success of our customer’s business. As an added value supplier, National Salt Distributors also distributes mulch & firewood products to our wide range of customers. We also carry a full-line of Sanygen & Baquacil pool & hot tub chemicals and supplies to include everything an owner would need to maintain their pool or hot tub. Our professional staff is very knowledgeable on all products and offer free computerized water testing and will recommend a treatment for your pool or spa to give you crystal clear water. We offer the largest selection or premium salt products such as water softener salt, deicing salt, bulk salt, agricultural salt, and pool salt. Steve Buck is the President & CEO of National Salt Distributors.